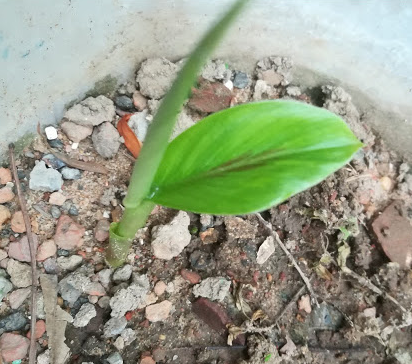 Curcuma caesia commonly known as black turmeric is actually a perennial herb with bluish-black rhizome. The plant is native to North-East and Central India. Black turmeric is also sparsely found in the Papi Hills of East Godavari, West Godavari, and the Khammam districts of Andhra Pradesh. It is a member of the ginger family (Zingiberaceae) which consists of 70 species of rhizomatous herbs making it a perennial rhizome. The rhizome of black turmeric has a high economic importance owing to its supposed medicinal properties. In west Bengal, the rhizome of the plant is used in Kali Puja, and therefore the plant is called Kali haldi. By etymology, Kali is the feminine form of Kala, which means black color and hence the plant is termed as black turmeric in English. The plant has been considered as endangered by the central forest department of India due to bio piracy. Black Turmeric is an erect, perennial herb that grows about 0.5 – 1.0 m tall in a tropical climate around the world. 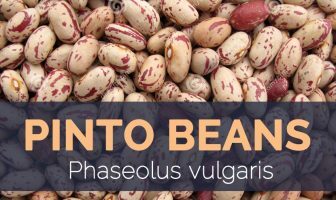 The plant grows well in fertile, well drained, sandy or pebbly, loamy soil that is moist. As the plant propagates with rhizome, the primary roots are not seen; however, yellow brown long fibrous and tapering adventitious roots are present all over the surface of rhizome. The cultivation and harvest practices are similar to that of common turmeric which is used in recipes. 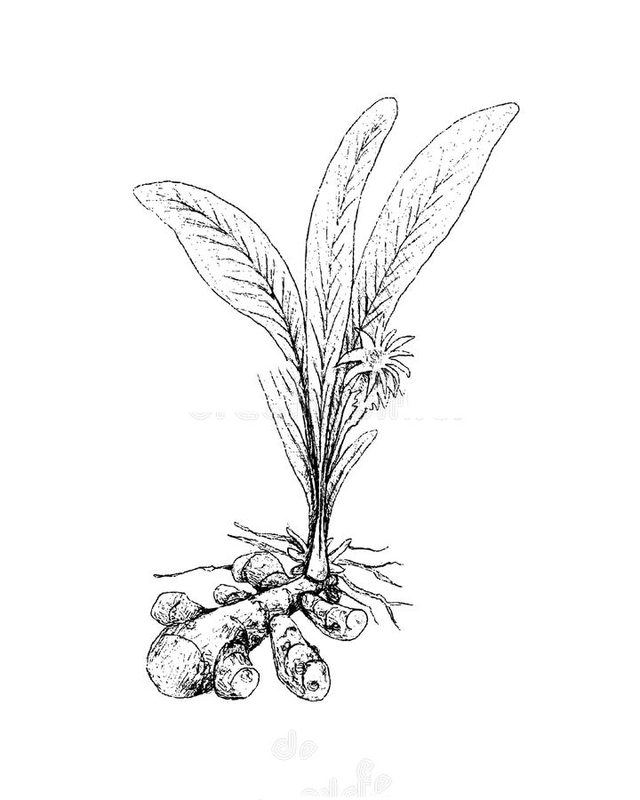 Rhizome is tuberous with camphoraceous sweet odor, about 2–6 cm in diameter, the shape and size is often variable. It is sessile, laterally flattened and covered with adventitious roots, root scars and warts. It shows longitudinal circular wrinkles on the surface giving the look of nodal and intermodal zones to the rhizomes. The surface (cork) of rhizome is dark brown, bluish black, or buff in color. It is fibrous with a strong camphor aroma are extremely bitter in taste as they are rich in alkaloids and are of immense therapeutic uses. The branching is more or less sympodral. 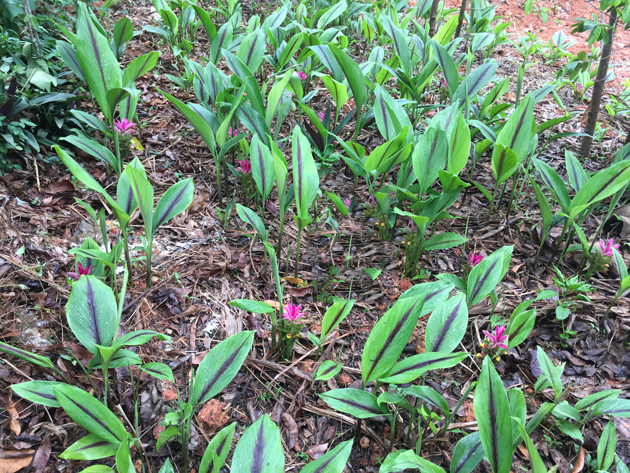 Leaves of black turmeric plant are elongated oval-shaped with a reddish color on the edges. Most of the leaf color is bright green, while the reverse side has a pale green color. Petiole has a white color ivory long enough. Flowers are pale yellow color with reddish border. Calyx is 10-15 mm long, obtuse and 3 toothed. Corolla is long tubular, pale yellow lip-3 lobe semi- elliptic. Black turmeric is native to northeastern and central India where it has been part of cultural ceremonies and medicinal remedies. Black turmeric is used by many tribal communities in the state of Madhya Pradesh. The herb is sold fresh or dried in markets across India and Southeast Asia. As of 2016, Black turmeric has been listed as an endangered species by the Indian Agricultural Department. Efforts are being made to protect and conserve Black turmeric in Odisha (formerly Orissa), on the central eastern coast, along the Bay of Bengal. Black Turmeric is quite beneficial to improve or treat lung illnesses such as asthma, bronchitis, pneumonia, etc. Again, the curcumin in Black Turmeric is the miracle worker here. This is because the compounds found in Turmeric do not interfere with the lung treatment of conventional drugs as well as our immune system’s good cells (unlike chemotherapy or some other medical treatments). Those suffering from the skin condition leucoderma, can apply black haldi on their patches. A readymade lotion too is available in the market. Black Turmeric is considered an excellent pain reliever. From rashes, toothaches, osteoarthritis to stomach problems, Black Turmeric can help relieve situations like these. Do note, however, that despite all these good effects, it must be taken in moderation or its proper dosage. Depending on what particular illness you are trying to cure or how much pain you are feeling. It is scientifically proven that the Black Turmeric’s curcumin can help prevent cancer cells from growing. It has also been proven that they modify pre-cancerous changes in the body organs. More research also show that the conventional chemotherapy paired with Turmeric can be a powerful combo in opposing cancer cells. So if you are looking for an anti-cancer remedy which doesn’t have side effects, you might want to look into the Black Turmeric. Black Turmeric helps in the breakdown of dietary fat in the body. If you are looking for that ideal body weight, adding a little bit of turmeric to your daily curries could be a starter for you! Efficient bile production aids in better digestion and prevents liver disease. It decreases the risks of developing insulin resistance in the body. Black turmeric can also help overcome skin itch. This is because the content in black turmeric is capable of being an anti-inflammatory so besides overcoming itchy skin, turmeric can also be used as anti-inflammatory on the skin itchy. This is the most common quality of the Black Turmeric and the other two types of Turmeric. They are natural antioxidants. Curcumin present in Turmeric is very effective in neutralizing free radicals. This is why if taken in moderation; the Black Turmeric can neutralize the free radicals which our body cannot. Thus, negating the effects of aging and cancer cells. Pair your Turmeric based dishes with some antioxidant fruits for dessert and voila! An effective anti-cancer and aging meal for the day is ready. Osteoarthritis is a pain and stiffness in joints. This disease mostly causes damage to the articular cartilage that exists in between joints of the joints. Black turmeric is found in Ibuprofen, which can correct the pain of old osteoarthritis. Black turmeric is used in diseases such as asthma, bronchitis and pneumonia. If you are worried about the new or old type of wet cough, turmeric is a panacea for this. For this, you can take turmeric bumps and wash it and grind its juice and drink it. This will soon remove your cough. Substance known as kurkumini in turmeric removes the element that causes the lung cancer. It decreases inflammation of the lungs and reaches patients with asthma. Consumption of black turmeric extract is beneficial for treating colitis. You can take black turmeric supplements, twice a day after meals. It will relieve colitis and support digestion. Like the other members of Ginger Family, these Rhizomes act as a nutritional supplement, a powerful medicinal herb to your diet. It increases stamina and vitality if consumed in small quantities. One should not consume turmeric black more than 500 mg per day beyond which could be hazardous to a human body. Rhizomes are used as a rubeficient to rub the body after taking a Turkish bath. Rhizomes of the herb are often used by the Baiga, Sahariya, Agariya, Gond, Korku, and other tribal communities of Mandla, Balaghat, Chhindwara, Anooppur, and Dindori district of Madhya Pradesh state for the treatment of pneumonia, cough, and cold in children, and for fever and asthma in adults. Powder of rhizomes is used by tribal women as a face-pack during their engagement and marriage period in northeast India. Fresh rhizomes are crushed and applied as a paste on forehead for relief from migraine or applied on the body for sprains and bruises. Kanti tribes apply fresh rhizome paste on snake and scorpion bites in Lohit district of Arunachal Pradesh. Rhizomes are claimed to have a property of acting against leukoderma, epilepsy, cancer and HIV/AIDS. Gondi people of Bastar apply rhizome paste on the hydrocele using betel leaves. 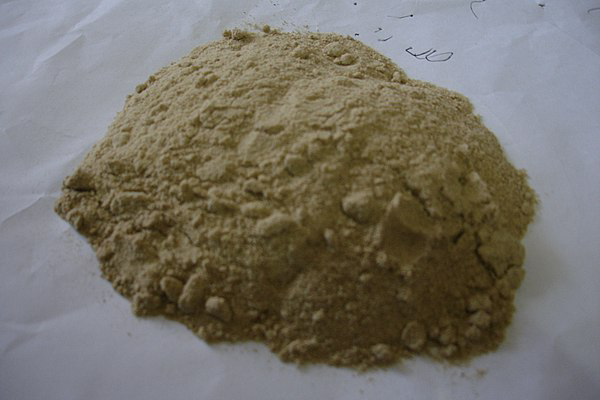 Intake of small amount of rhizome paste is claimed to expel gases from stomach and cure menstrual disorders. Decoction prepared from its roots is a good herbal treatment for Migraine and Epilepsy. It combats the problem of Feverishness. Tincture of Black Turmeric powder is useful for Toothache. Black Turmeric possesses Anti-Cancer Properties. It is advantageous for women. It helps in curbing Menstrual Disorders like Menopause, Leucorrhea, and Difficult Menses. 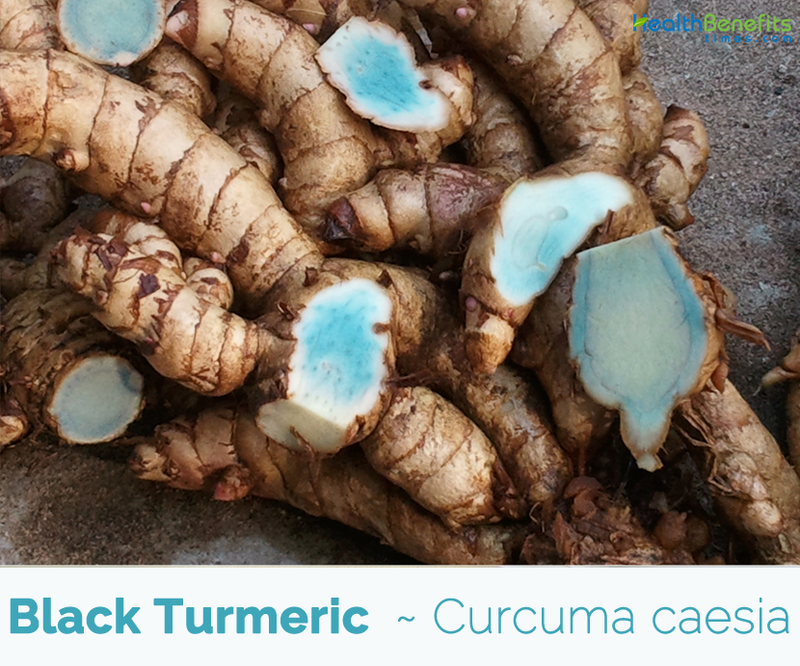 Black turmeric root is crushed and can be applied to bruises and sprains to ease discomfort or applied to the forehead to help relieve symptoms of migraines. The Khamti tribe of Lohit district applied the paste of fresh rhizome in case of snake and scorpion bite. 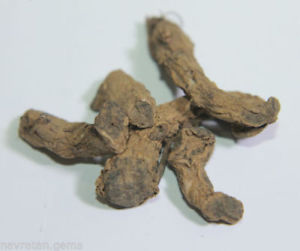 Dried rhizomes and leaves of curcuma caesia Roxb are used in piles, leprosy, asthma, cancer, wounds, impotency, fertility, tooth ache, vomiting, and allergies. Fresh rhizome decoction is used as ant diarrhoeiaric and to get relief from stomach ache. Dried powder used to mixed with seed powder of Andrographis paniculata Wall ex. Nees and applied during insect and snake bite. 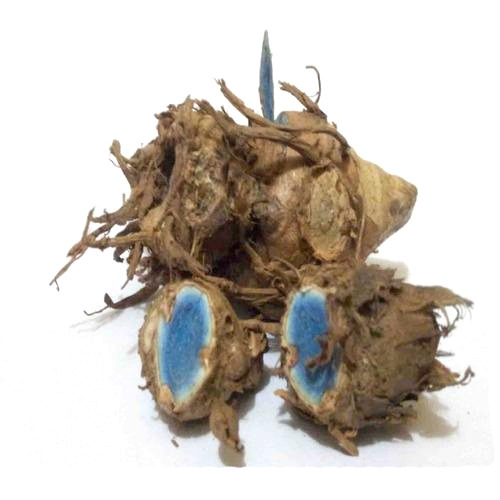 Rhizome is used for the treatment of cough, fever, dysentery, worm infection. Fresh rhizomes are used in leprosy, cancer, epilepsy, anti-helminthic, aphrodisiac, gonorrheal discharge. Rhizome of Curcuma caesia is grounded in the form of paste in rheumatic arthritis. 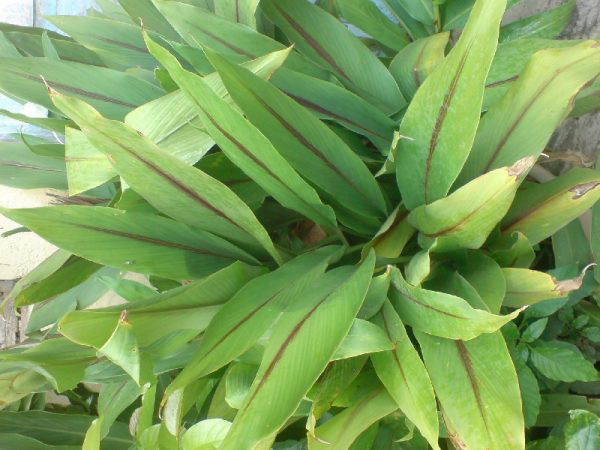 Rhizome of Curcuma caesia is grounded and applied in the form of paste in rheumatic arthritis. Crushed rhizome paste is applied against cur or injury to control bleeding and quick healing. Rhizome Curcuma caesia is administered during inflammation of tonsils. 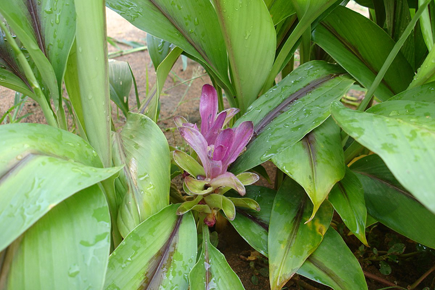 Roots of the Curcuma caesia are grounded into powder and used water to treat gastric disorder. Paste is applied on bruises, contusions and rheumatic pains in Manipur. In Arunachal Pradesh, Adi tribes use decoction of fresh rhizome as anti-diarrheic. Toothache: Take a pinch of black Turmeric powder and do gentle massage on the affected tooth. Make sure you take only pinch, do not take it in large amount. Wounds: Crush fresh turmeric and make a fine paste. Apply this on the affected wound. This will heal the wound at faster rate. 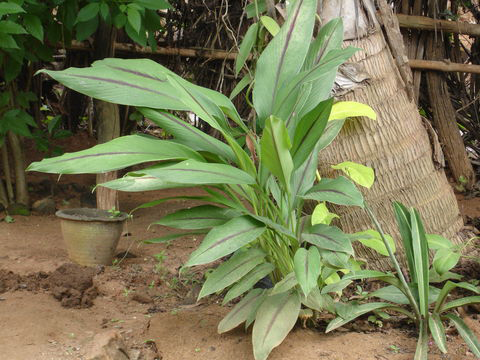 Rhizome of the plant is used in Kali Puja, and hence the plant is called Kali haldi in West Bengal. In Chhattisgarh, tribes make paste of rhizomes using cow’s urine and apply the mixture on forehead as Bindi along with blood, for Vasikaran and Tantra practices. Some tribes believe that the rhizomes act as a talisman to keep evil spirits away. Some people believe that the rhizome of the plant is a form of the goddess Kali and carry a rhizome in their pockets. Some Hindu organizations sell rhizome paste to use as Tilaka, with a belief that it will remove all kinds of black magic. Color of the root is considered similar to the skin complexion of several Hindu deities: Kali, Rama, Krishna, and Shiva. The plant is regarded as very auspicious and is stated that a person who possess it will never experience shortage of cereals and food in Madhya Pradesh. Flower Flowers are funnel-shaped and white and are arranged in spikes. Black turmeric can be peeled and then cut into chunks, then blended along with kale, ginger, lemon and cucumber for a health-boosted green smoothie.